Chicken Avocado Toast Deluxe - A recipe from Savor California, the online showcase for extraordinary gourmet foods and beverages from California. Spread hummus on the toasted bread. 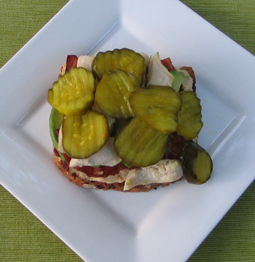 Top with slices of crisp bacon, sliced avocado, and chicken.